Relational Connectedness – What is That? Recently, after a very encouraging workshop, I was able to almost immediately apply what I had experienced in a little different setting. It’s always a joy to make practical application of things I am learning and to watch the Lord use ideas, principles and opportunities He affords in ways that achieve His desired results. While learning about shepherding others in a spiritual setting, we were introduced to the concept of relating transparently and truly connecting with one another. In worship this morning I had the privilege of sitting next to someone I had never met before. We began our conversation with the normal greetings. And then wanting to apply these new principles I had learned, I went further in conversation in the brief time allotted and began to see and truly enjoy how and why the Lord had allowed our paths to cross. I was beginning to connect! Wow, all of this information learned in just a short period of time! This discussion allowed us to truly communicate and learn something about each other, to become comfortable as we conversed and also gave me an avenue to encourage him to attend a men’s Sunday School Class (I even invited him to visit our ladies class. HA!). When the worship service was over, he turned to speak to me before I could even open my mouth (highly unusual as I’m always ready to say something). Both of us were glad we had the opportunity to meet. We’ll most likely remember each other’s names, where we prefer to sit in the Sanctuary and the fact that we both love our church. Now I will be looking for him in the weeks to come. I truly felt the Lord’s guidance as He allowed me to relate to and connect with someone with whom I had never spoken before. I was able to make a new connection in the church where I had been attending for so long. There’s really something to this “connecting” thing. What many of us need to do though, is to DIS-connect: from our smart phones and computers and use the time God has given us to focus on something of vital importance – relationships with God’s people who are made in His image. When we begin to connect with another person we become intentional in creating that relationship or we intentionally go deeper in the way in which we already relate to them. This sort of thing doesn’t just happen automatically – it takes a little planning and sometimes a lot of our time. But aren’t people worth it? What about those who don’t know Jesus? Who is going to take time to share with them? If the Lord puts them in your path, it could very well be you! Let’s practice “relational connectedness” at every opportunity. Pray and ask the Lord with whom He would have you become more involved / more connected. The blessing is in the doing, especially if the Lord is the one Who does the directing. If you encounter someone you don’t know, stop and find out something about them. If someone’s name comes across your mind, give them a call, write them a note, plan to have coffee or a meal with them or just spend time enjoying each other’s company. I like to take short day trips with my friends. This is time I am able to spend with them in a different setting while both of us enjoy our friendship and God’s beautiful creation. Those are the experiences in life that can make such a difference. Laughter and good times are always best when shared with friends. My next planned encounters include supper with someone who serves in the same volunteer capacity in the Bible Study we both attend. She and I have known each other for 5 or 6 years, but it’s always neat to share ideas, our recent experiences as well as our prayer requests when we get together. Next week I will have lunch with someone I briefly met in May at our church’s Women’s Conference so I can get to know her a little better. None of this is possible without purposefully making time in our schedules. Unless we are intentional in connecting relationally, we cannot positively affect another person’s life. Plus, connecting also enhances the quality of our lives as well. Start practicing relational connectedness today – you won’t be sorry you did…and neither will the other person! Over the last few weeks our Ladies I Class at my church has been studying surrender, obedience and revival to show our commitment to pleasing the Lord in all that we say and do. Will you prayerfully consider giving up a particular TV show, not going to a certain popular movie or putting down (or even throwing away) a best-selling book that “everyone is reading”? How is your life different from those around you? To truly be obedient to a Holy God we must incorporate His rules for living. The article referenced above sheds some light in areas that are vital to doing this. To help with the process we should daily digest portions of God’s Word and His principles. This allows the Holy Spirit to incrementally help us discern the good from His best. When you read and pray through the Scriptures, ask the Lord to show you the next critical step to take on your narrow road to surrender and obedience. These are pre-requisites for personal and corporate revival. What change(s) do YOU need to make? We are called to be different! How is your life different from your co-worker’s, your neighbor’s or even a family member’s? Obediently pleasing God must be our first priority. Is it yours? Here is a survey we’ll be using in our class on Sunday. Hope it is encouraging and beneficial to you. Many blessings as you strive for spiritual maturity in this important area of our lives. Humility Survey – Am I Humble? Humility in the abstract matters little; it’s how humbly we act in normal, everyday circumstances that determines whether we build up or tear down those we love. It’s worth considering how we would handle some true-to-life situations where we have a choice to act with pride or humility. a. Interrupt to top his story with an even more impressive story about myself. b. Say nothing but let my body language convey that I don’t think much of the story. c. Show interest and ask questions. a. Try to make myself look good, even if it means taking credit for others’ accomplishments. b. Mention my own work for the company, when given an opening. c. Point out the contribution of others, while letting my own actions speak for themselves. a. Find fault with her accomplishment and then try to turn the attention to myself. c. Congratulate her and make sure others learn of what she has done. a. Consider how his failing might benefit me. b. Casually mention the incident to someone else. c. Look for an opportunity to affirm him. a. Think about who might have contributed to the weakness. b. Try not to think about it at all. c. Take steps to correct that weakness in the future. Give yourself zero points for each “a” answer; one point for each “b” answer and two points for each “c” answer. The higher your score, the farther along you may be on the road to genuine humility. Three for Free or Four More for a Dollar!! Oh, out of the mouths of babes, right? Well, where else would you hear a statement like this, “Three for free or four more for a dollar”? It was the most interesting and fun visit to my hairdresser I’ve ever had! I was her last appointment of the day, and her grandchildren had been playing outside, coming in from time to time to make profound statements here and there. I was definitely amused by them, especially when the little girl started talking about the oranges outside the shop. Upon arriving I had noticed a little red wagon full of what appeared to be oranges, so my ears definitely perked up when this became the topic of conversation inside. 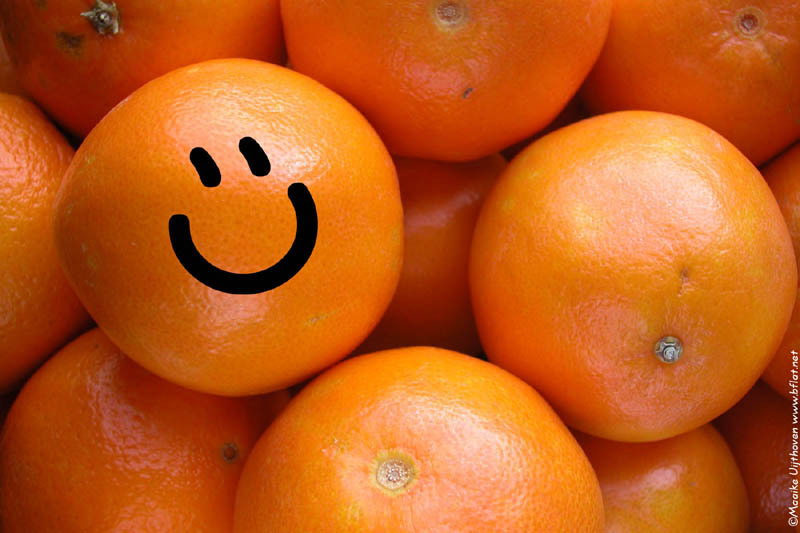 The granddaughter stated, like a true entrepreneur, “Would you like to buy some oranges”? And since it was the end of satsuma season in South Louisiana, I had been contemplating an alternative, but before I could respond she said in a most business-like fashion: “You can have three for free or four more for a dollar!” At that point her grandmother, mother and I all burst into laughter at her enterprising thought process. Well, of course I told her I would take some, and she inquired as to how many I would like. The grandmother told her and her little brother to go out and get twelve “good” ones, not the ones that were soft. It was at that point when I noticed out of the corner of my eye (you can’t really turn your head when your hair is being cut you know) that the grandfather had gotten involved in the process to ensure that I would receive quality produce for their efforts and my good money. The full intent of the adults (while the children were outside getting my treats) was to give them the dollar from the tip money jar as they assured me I didn’t have to pay for them. But I insisted as this would be a true business transaction to help them learn the value of working for their pay. So, when they arrived back inside, they proudly announced that they had even given me two extra oranges for the same price. The little boy could not yet write, but he had put the oranges in a box and proceeded to tell me he would sign the box for me. In his own little way he placed pencil scribbles on all sides of the flaps, and I thanked him for autographing it for me. He then picked up the box, deposited it at my feet, sighed and stated, “It’s heavy, and I’m the man!” We laughed once again, and then it was time for me to pay for my purchase. I asked the little girl to hold out her hand so I could give her the dollar bill. She was so pleased with herself, and then the mother also gave the little boy a dollar bill from the tip jar. With that they both exclaimed that they were now going to the Dollar Tree to buy something. What a neat day this was! They each had three one dollar bills (apparently they had been selling oranges earlier in the afternoon as well) so I told them they could go to the Dollar Tree three times now. We enjoyed watching them participate in this experience, and I went home with shorter hair and a joyful spirit knowing I had helped two young people learn a little about free enterprise, plus I was happy that now I had some delectable fruit to eat. The lesson in our ladies class at church this week is on humility. It’s when we have a truly humble heart that it doesn’t matter in the least whether we receive recognition for what we’ve done or not. We do things for others simply because these people have value, it will be of benefit to them, and it’s what Jesus would do if He were on this earth. The next time we find ourselves feeling a little prideful and wanting recognition, here’s a good question to ask: “Am I doing this for something in return?” Are we then, in effect, saying, “Lord, I’ll do this little thing for You without any recognition, but if You want me to do anything more, You’ll need to recognize me in some way?” If we do something to get the attention of others it’s really a form of pride, which is the exact opposite of humility. Jesus is the epitome of how to exhibit humility. We are to emulate Him in all we do. He came as a humble servant…just for us. How much do we owe Him? We owe Him nothing less than our lives. Not to get that “dollar” but out of true gratitude for His sacrifice so we will spend eternity with Him in heaven. Is the Bible Practical…Is Forgiveness? If you think the Bible isn’t practical to everyday life, let’s look at this a little further. Our ladies class at my church is studying the topic of “Authentic Love”, as we look at the biblical basis underlying Dr. Gary Chapman’s book, “Love as a Way of Life”. Our current study is teaching us a different aspect of authentic love each week. 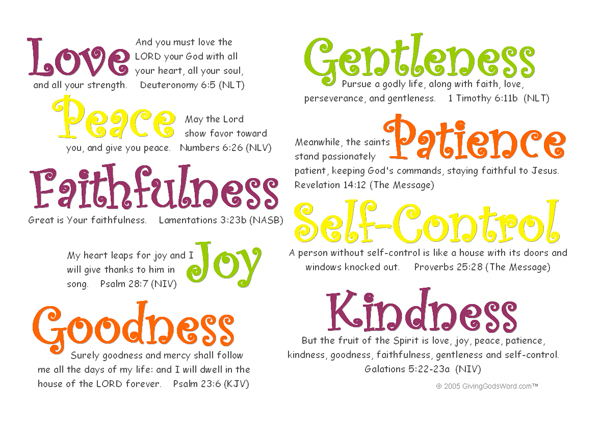 Many of these correlate to these qualities in Galatians. Thus far we have studied kindness and patience, and this week’s study (January 29) is on the topic of forgiveness. One may ask the question, “Are we really supposed to forgive?” or “How can we truly forgive someone when they’ve hurt us very badly?” Both are valid questions and deserve a valid answer. Jesus was our perfect example of how to treat others. Oh, I know, He was perfect, and we can’t be expected to be perfect like Him, can we? No, we can’t be “perfect”, but if we truly have a personal relationship with Jesus we want to please Him, to obey Him, by emulating His example in our own lives. As we live by biblical principles in our lives we grow in our likeness to Jesus, and this growth, this spiritual maturity, is a process of perfection (sanctification). So, how does that translate into being able to truly forgive others? Well, if you know anything about Jesus or the Bible, Jesus was the ultimate forgiver. What Jesus did on the cross for EVERYONE on this earth, believer or non-believer, was to die for the forgiveness of our sins. If for nothing else but our indebtedness to Him for the sacrificial shedding of His blood for us, we should be willing to forgive others who do much less damage than crucifying us! When we open our hearts and hands to others in forgiveness, our lives are open for God to pour forgiveness and blessing into our lives. We need to respect the person who has wronged us, no matter what they’ve done. Our immediate response and selfish nature tell us to seek revenge. But that is a dangerous thing to consider. God is very clear about vengeance. He states in His Word that it belongs to Him and Him alone – and He will repay (Romans 12:19). It is not OUR job. Sometimes it is very difficult to offer forgiveness or to even feel it in our hearts. Sometimes the other person isn’t sorry about the offense, and that makes it worse. Then sometimes, all we can do is to release that person for hurting us. They are feeling no remorse, they are not miserable, they don’t even think about it! But keeping that hurt and unforgiveness inside does hurt us. It grows and snowballs into anger, then bitterness and hatred. These emotions lead to self-destruction. Don’t do it – release that person from the offense and use your energies in a positive, constructive way to go about your life. Leave the burden with God and let Him deal with the person who offended you. Put your hurt in His hand, as He knows how you feel. Comfort will come from Him in time, not from holding onto the bitter feelings against that person. How do you want to live the rest of your life after someone hurts you? I don’t know about you, but I don’t want to be a bitter old woman! Plus, I definitely don’t want to be a poor representative of Jesus, who I am trying to please and exemplify to others. 12 God has chosen you and made you his holy people. He loves you. So you should always clothe yourselves with mercy, kindness, humility, gentleness, and patience. 13 Bear with each other, and forgive each other. If someone does wrong to you, forgive that person because the Lord forgave you. Is the Bible practical? Is forgiveness practical? The answer to both questions is yes! That doesn’t mean the process is easy, but we have the greatest power in heaven and on earth to help us live the life that pleases God through the presence of the Holy Spirit within us if we are saved. What more motivation could we have? To me, that is very practical! Whew, time surely does fly these days, doesn’t it? I think it has something to do with the aging process…right? When I visited the park this afternoon after a light rain, my favorite picnic table was a little wet. I had planned to sit and relax while I worked on some correspondence and then read a little to begin preparing for next Sunday’s lesson. Instead, I decided to walk over to the little wooden deck that jutted out over the pond. As soon as I arrived I stopped to lean on the railing and look down into the murky water. I wasn’t there a full minute before I saw a lot of small bream congregating just below me. They weren’t scared of my movement but appeared to be waiting for something. If I had wanted to catch any fish this would be the time to do it, although they were probably four inches or less in length. What an opportunity! They were swimming around right below me. Little did they know that if I had a net I could have scooped all of them right out of their familiar surroundings, but it would have taken about 50 of them to make a decent meal. Realizing they were waiting for food, I went back to my car for some cheese. As I stood there pinching off little pieces and dropping them to the water below, I began to think about how I could apply this spiritually. Jesus never missed an opportunity to reach out to those in need, giving them food or water or encouraging them to accept Him, the Living Water, Who could give them eternal life. Jesus went fishing as He walked along the dusty paths during His ministry on earth. He called His first disciples in Matthew 4:19 when He said, “Follow Me, and I will make you fishers of men.” Fishing for souls. Not fish. But several of the disciples were actual fishermen by trade, so this statement by Jesus was definitely well understood by those He called as His closest followers. I could have gone fishing today…for little bream. But I didn’t. I just fed them, which brought me joy. I’m sure the fish enjoyed it, too, judging by how fast they darted when a bite of food hit the water’s surface. I could have also gone fishing for souls today. Did I? No. Well, I didn’t see anyone out at the park to talk to other than one of the workers there. I have asked him to visit my church, and He is a believer already. Maybe I need to be a little more purposeful in planning my “fishing” trips. Am I putting myself in situations with non-believers? Have I prayed for the Lord to prepare my heart and then prompt me concerning where to go and who to talk to? I want to be an obedient follower, to be a fisher of men. But it doesn’t just happen. I must be purposeful, be prayerful and then be faithful. Fishing for man’s eternal soul is a whole lot more rewarding than fishing for little bream in a murky pond.